Data Cleanup Tools -- Are you getting the most out of DonorSnap? Now that you are on board with the benefits of keeping your database clean, let's take a look at some of the tools built into DonorSnap that make it easy. Let's start with the low hanging fruit. Your lookup or dropdown fields have pre-determined values that you can choose from. If there's any duplicates or typos within one field such as Campaign or Appeal Code, DonorSnap makes it easy to merge them. This will correct all existing records using these values in one swoop. Click on the DonorSnap Site Lookups tab to find all of the system fields like Accounting Code, Contact Type, etc. Click the User Defined Setup tab and then the "Lookups for User Defined Controls" right beneath it to see the fields you created. In the upper right corner of the expanded window you'll see the "Change all records from one description to another" button. Now to get to the heart of your database cleanup, you'll need to find all of the duplicate contacts within your database. 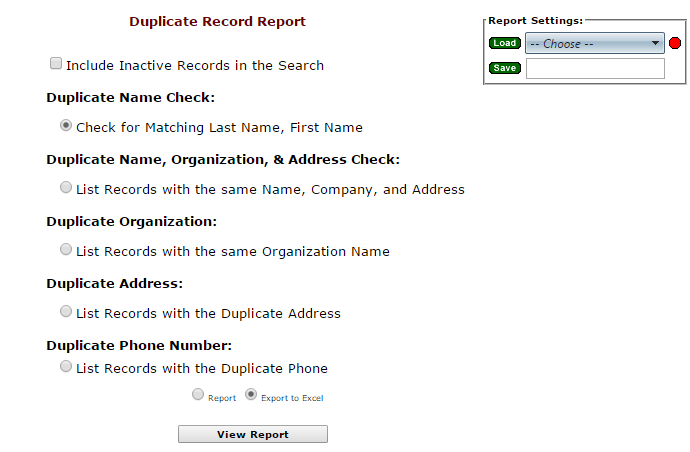 The Duplicates Report is found under Reports > Administrative Reports and provides five different methods for determining duplicates. Once you run your report, you can view it as a PDF or export it directly to Excel. If you're cleaning up many duplicates, take advantage of editing the data right in Excel. You can then use the Excel Import tool to upload any changes you make back into your database. The Merge Duplicates tool will also come in handy as I'll explain next. Now that you've found your duplicates, you'll need to move all of the activity records (donations, interactions, notes, etc.) from the old contact record to the new one and inactivate the old contact. This tool is very simple to use. (It does not change any contact information; you'll want to use Excel Import for those changes.) Just select the two contacts and click the button. This tool is a huge time saver when you are making a large amount of changes to the contact information for multiple contacts. Don't fret with looking up each contact individually, make your changes in Excel and then upload the spreadsheet. Not only is this tool helpful for combining duplicate contact records, it's great for making mass changes to your database. For example, let's say that you haven't been using the ContactType field in the past, but your organization now has a lot a of businesses in your database. Using Excel, it's easy to add the value of "Individual" to all of your records for people and "Business" for all of your business records. The same is true for other changes such as mass inactivating contacts or updating membership expiration dates. Sometimes your database isn't as black and white with which contacts you need to keep track of. You've certainly got your active contacts, but let's say you want to remove some of your contacts from your active list and still need to keep the information you have for them. That's where inactivating a record comes in handy. When you mark a contact as inactive, you can run your reports or set up your mailing lists without including those contacts. Looking for more help? Watch the Cleaning Up Your Database Training Webinar. We know that you share your experience using DonorSnap with other organizations. Those referrals have helped make DonorSnap what it is today. For one more month, we would like to give back to you for doing what you are already doing.